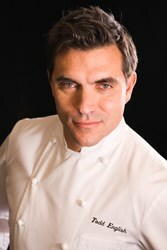 Todd English joins celebrity chefs from across the U.S. and Las Vegas in a celebration of Asian cuisine. LUCKYRICE festivals are a real inspiration showing me not only how chefs are creating and interpreting Asian cuisine, but how guests are reacting to new flavors and presentations. Celebrity Chef Todd English joins a host of culinary stars in showcasing their best Southeast Asian recipes at this year’s LUCKYRICE Night Market at The Cosmopolitan in Las Vegas on Saturday, October 5th. English will be representing Todd English P.U.B with his award winning Hoisin Braised Short Rib Steamed Bun with 5-Spice Rubbed Tenderloin and Sweet & Sour Pickles. The recipe was the recent 2013 winner at the South Beach Wine & Food Festival “Q” Event. Todd English P.U.B. (which stands for Public Urban Bar) is located at the fashionable Crystals at CityCenter on the Las Vegas strip and offers an eclectic mix of traditional American comfort foods as well as modern interpretations of traditional English pub fare. The LUCKYRICE Night Market brings the aromas and sensations of Asian markets from Taiwan to Thailand to the Boulevard Pool at The Cosmopolitan. Celebrity chefs from across the U.S. and Las Vegas will be on hand to celebrate the energy of the quintessential Asian night market experience. The LUCKYRICE Night Market takes place Saturday, October 5th from 7 to 10 p.m. at The Cosmopolitan in Las Vegas, 3708 Las Vegas Blvd. South. Tickets are $125 for VIP and $88 for general admission. For further information, please visit http://www.luckyrice.com.